Despite arriving in Colombia as the new World Championship leader Thomas Chareyre was found wanting as he was out-gunned by Pavel Kejmar at the penultimate Grand Prix, the Czech Republic rider racing to an impressive double-moto victory in front of thousands of fans on what was an historic day for S1GP. But, there equally impressive performances from a number of home riders, more notably David Burbano , creating a memorable debut GP for the Colombian fans in Chachagui. HONDA L30 Ivan LAZZARINI took the early advantage at the start of race one as TM Racing Thomas CHAREYRE and HUSQVARNA 833 Pavel KEJMAR tucked in neatly behind. Behind them, SUKUZI Team Grau David GIMENEZ, HONDA Assomotor Christian RAVAGLIA, SUZUKI Team Grau Valerio PIEDRAHITA, BURBANO were also in the mix. By lap two, Chareyre had been pushed back to third by Kejmar, as Lazzarini opened up a 0.9 second advantage at the front. Ravaglia made a small mistake and dropped to 8th, as HUSQVARNA Lukas HOELLBACHER who started from the back of the grid after suffering shoulder and collarbone injuries in the second free practice on Saturday, started to climb through the field to reach 11th by Lap 4. On Lap 6 Kejmar took control of the race as he passed Lazzarini but the gap to Chareyre was now more than one second – 1.4 to be precise. All eyes were on Valerio PIEDRAHITA though as he made the most of his qualifying position and from the second lap was circulating in fourth, doing his best to fend off the challenge of Ravaglia. His fellow countryman David BURBANO was also on the charge, and despite losing a few positions early on, soon found himself back up to sixth by the halfway point of the race. 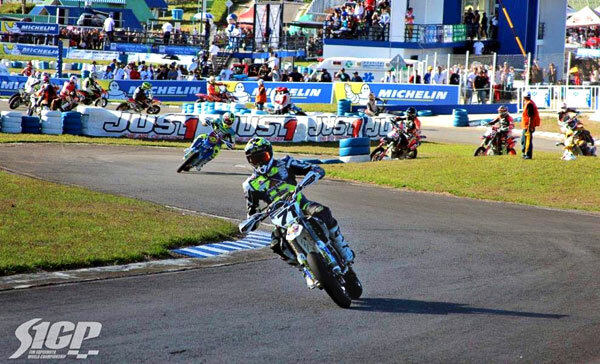 The S1GP championship leader Chareyre through, was struggling for pace by his standards and was more than three seconds adrift of Kejmar and Lazzarini. With six laps to go the battle for sixth was intense as three riders, Burbano, Gimenez and HONDA Assomotor Bartolini were locked together, wheel-to-wheel. With four laps to go Kejmar was just over a second clear of Lazzarini, with Chareyre a further four seconds back, dropping to seven seconds on the following lap. S1GP Race 1 Top Ten: 1. KEJMAR Pavel (CZE-Husqvarna) 19:51.501; 2. LAZZARINI Ivan (ITA-Honda) 19:53.002; 3. CHAREYRE Thomas (FRA-TM) 20:03.477; 4. PIEDRAHITA OCAMPO Valerio (COL-Suzuki) 20:18.667; 5. RAVAGLIA Christian (ITA-Honda) 20:18.784; 6. BURBANO David (COL-Suzuki) 20:24.312; 7. GIMENEZ David (ESP-Suzuki) 20:28.307; 8. BARTOLINI Fabrizio (ITA-Honda) 20:30.284; 9. VERDEROSA Massimiliano (ITA-Honda) 20:31.666; 10. SALAZAR CERON Rigo German (COL-KTM) 20:35.888. From the moment the lights went out Pavel KEJMAR made his intentions clear and had the Czech rider had nothing else on his mind other than winning and at the end of lap one it was he who led over the line with Thomas CHAREYRE, Ivan LAZZARINI, Christian RAVAGLIA and David BURBANO rounding out the top five. Valerio PIEDRAHITA OCAMPO was next in sixth as Lukas HOELLBACHER found himself in fourteenth. On lap two Piedrahita fell, remounting in seventeenth, promoting those behind him up another position. Milan SITNIANSKY, who’d started eighth was now in seventh after the mistake from the Colombian but then he too fell from seventh to eleventh after making a mistake of his own and would eventually come home in tenth. By lap four, the fast starting Brian GUERRERO TEZ found himself falling back as he was passed by Max VERDEROSA and Rigo German SALAZAR CERON, as Hoellbacher climbed to ninth, bringing with him the Italian Fabrizio BARTOLINI who’d also suffered a poor opening lap. Lap five and the top seven remained unchanged but Hoellbacher was now up to eighth, Bartolini ninth as Tez faded to tenth. As the race neared the halfway mark, Pavel Kejmar and Thomas Chareyre were separated by less than half-a-second with Lazzarini four seconds further back, the Italian seemingly having no answer to the pace of the leading duo. At the halfway point in the race, Kejmar found himself leading with the biggest margin of the race, 0.6 seconds over Chareyre, the Frenchman clearly benefitting from the changes he’d made to his machine after race one. Lazzarini was still third, but Ravaglia and David BURBANO were in a heated battle for fourth, the home rider relishing the battle in front of his home crowd. With five laps to go Chareyre had reduced the gap to Kejmar to 0.3 seconds and by another tenth the following lap. As the leaders entered the final lap it was all-or-nothing but it was Kejmar who held on for the win, his second of the day and his first double-moto victory to secure the GP win. Chareyre was second in the race, which was good enough for second overall. Lazzarini crossed the line in third to round out the final step of the podium. Ravaglia held on for fourth but the fans favourite in race two was David Burbano who pushed Ravaglia all the way to the flag to take fifth. S1GP Race 2 Top Ten: 1. KEJMAR Pavel (CZE-Husqvarna) 19:50.932; 2. CHAREYRE Thomas (FRA-TM) 19:51.122; 3. LAZZARINI Ivan (ITA-Honda) 20:04.844; 4. RAVAGLIA Christian (ITA-Honda) 20:10.979; 5. BURBANO David (COL-Suzuki) 20:11.217; 6. VERDEROSA Massimiliano (ITA-Honda) 20:19.760; 7. HOLLBACHER Lukas (AUT-Husqvarna) 20:19.945; 8. SALAZAR CERON Rigo German (COL-KTM) 20:27.906; 9. BARTOLINI Fabrizio (ITA-Honda) 20:31.124; 10. SITNIANSKY Milan (CZE-Honda) 20:31.336. S1GP Overall Top Ten: 1. KEJMAR Pavel (CZE-Husqvarna) points 50; 2. CHAREYRE Thomas (FRA-TM) p. 42; 3. LAZZARINI Ivan (ITA-Honda) p. 42; 4. RAVAGLIA Christian (ITA-Honda) p. 34; 5. BURBANO David (COL-Suzuki) p. 31; 6. VERDEROSA Massimiliano (ITA-Honda) p. 27; 7. PIEDRAHITA OCAMPO Valerio (COL-Suzuki) p. 27; 8. BARTOLINI Fabrizio (ITA-Honda) p. 25; 9. HOLLBACHER Lukas (AUT-Husqvarna) p. 24; 10. SALAZAR CERON Rigo German (COL-KTM) p. 24. S1GP Championship Top Ten: 1. CHAREYRE Thomas (FRA-TM) points 253; 2. LAZZARINI Ivan (ITA-Honda) p. 240; 3. KEJMAR Pavel (CZE-Husqvarna) p. 211; 4. HOLLBACHER Lukas (AUT-Husqvarna) p. 206; 5. HERMUNEN Mauno (FIN-TM) p. 188; 6. RAVAGLIA Christian (ITA-Honda) p. 170; 7. VERMEULEN Devon (NED-Ktm) p. 149; 8. VERDEROSA Massimiliano (ITA-Honda) p. 140; 9. KINGELIN Asseri (FIN-Honda) p. 135; 10. MONTICELLI Teo (ITA-Honda) p. 135. S1GP Manufacturers: 1. TM points 289; 2. Husqvarna p. 247; 3. Honda p. 242; 4. KTM p. 173; 5. Suzuki p. 114; 6. Yamaha p. 0. Click HERE for the complete list of countries and cooperating broadcasting networks, viewing times can be viewed by clicking on the logo of your chosen broadcasting network. 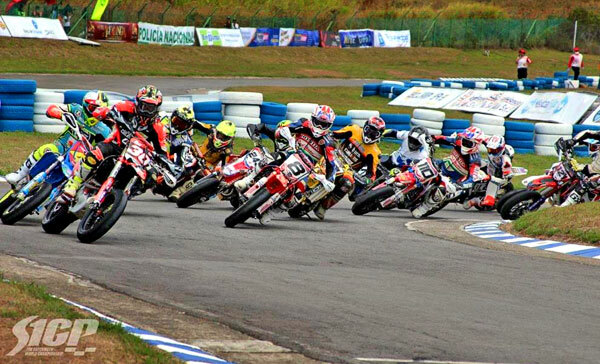 The FIM Supermoto World Championship will be back in Austria, Melk on 20 September for the final Grand Prix where will be crowned the 2015 Champion. 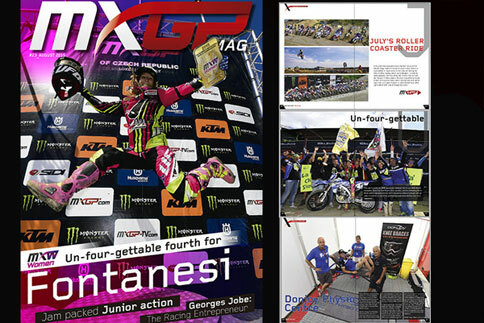 MXGP Mag issue 23 is live!